Pure, clean, clear, clean, simple, plain, authentic, wholesome, pristine, immaculate, untainted, true, flawless, natural, unstained, genuine, virtuous, unblemished, straight….perfect. These are words that pretty much everyone likes, and for good reason. They all describe something that maintains simplicity and stays away from static that deters from reaching success in any situation. In this business, static runs rampant and usually sidetracks us from the most obvious or predictable outcomes. I wouldn't describe what we discuss on this site as a method or particular strategy, etc. I would describe it as a foundation where traders can build and shoot off in any countless number of directions they choose. There are certain things that matter most in any endeavor. For the purpose of our market there are global variables that will always remain constant – news and reference guides. Technical levels are just one example of a reference guide. “Overthink” can kill us. People that worry too much about anything usually feel the negative repercussions of such as some point, and to a degree based on how much of that worry they generally output. This site was born on the most simplified explanations for everything so today I just want to recap some of the basic principles we discuss regularly. 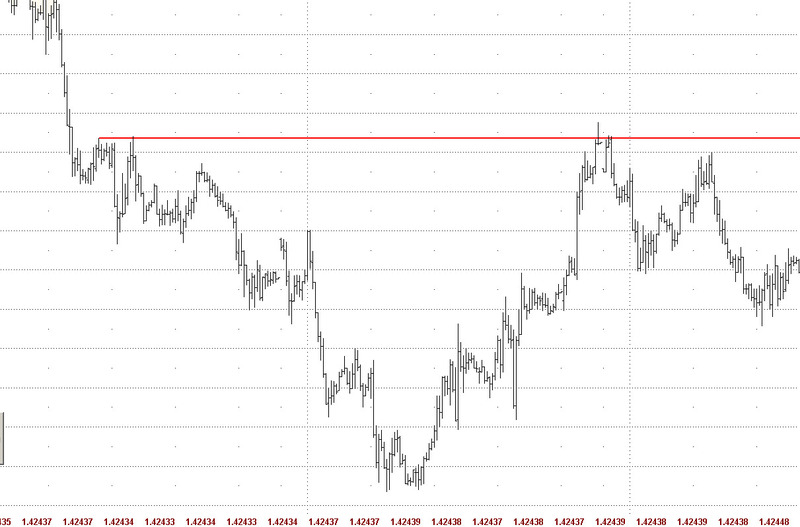 NBT's spike base pattern on EUR/USD. It's just a line, folks, just a line. Get rid of everything that confuses you, everything that doesn't matter, everything that stands in your way of seeing the “real light”. If your chart consists of 50 trendlines then chances are you are subject to overthink and it could be a direct reflection of how you are managing your trades. Confusion or lack of conviction is nothing more than a result of you second-guessing everything, and drawing a million lines on your charts is an easy way to go down this path. Any “system” that you have essentially gets voided in lieu of you brains getting scrambled on a regular basis. A routine consists of everything you do on the technical side as much as it does on the fundamental. Use RSS readers, subscribe for email updates to regular sites, have easily accessible folders for anything you need quick access to (eg chart notes or trade logs) on a regular basis. Scrambling from one task to another is likely to add to a pile of unwanted confusion that could potentially interfere with your trading routine. It's hard to stay organized, I know, just mainly due to the amount of information available on a daily basis, but there are certainly ways to enhance this if it is indeed an issue. I don't read a lot of analysis, as many of you know. I like plain old news stripped of opinion that I can then take and base my own interpretations. One of the bad effects to a constant injection of analysis is confusion. If you're receiving regular analysis from a “higher power”, first, always question the analysis. Remember that people are people, no matter how many Masters degrees or certifications they have. People also have tendencies to be wrong that have been doing this for 30 years. No one is going to be right all the time, and heaven forbid you take action on a horrible idea. Analysis is great for getting a “heads up” on something you might have overlooked, and that's all I truly ever recommend using it for. Whether an entirely new concept of which you previously had no knowledge or an upcoming event, etc., people are always listening to different things and one way to stay on top of it all is by reading the analysis of others. How many people really keep it simple in this business? Just take a look at the regular injection of mind-boggling data out there and you'll see that no one on the planet seems to really be keeping it simple. Simply filled with junk that serves little value to a bottom line, perhaps, but great for entertainment. When you're trading the currencies of entire nations, you better bet that there are a wide range of variables affecting price. KISS for beginners strips price down to its most basic components, focuses in on the most fundamental aspects of global economies, and dictates simplified methods of risk and money management. KISS for experts means bypassing the noise and boiling price down to what really matters. Some people are naturally wired to want to investigate more and delve deeper into a world that could simply lead them into nothing but confusion, and (perhaps more dreadfully) without even knowing it. KISS for experts means ignoring the junk. It means not wasting your precious life on things that simply don't matter, and breaking things down into the most fundamental components in order to take one, simple action: hit “buy” or “sell”. This site originated from a slew of posts that focused on doing one thing: drawing a single line on a chart. So get caught up if it interests you, but don't let it affect the most basic premises made available to daytraders. One of the more interesting reads in my life was the Market Wizards interview with Bruce Kovner. When he explained his routine for getting into and out of the market, it shadowed the most basic principles of everything we do here: week begins, draw some lines, know what you're going to do when those lines get hit: fade or follow through. So big or small, the premise remains the same. Confusion piggybacks on unnecessary inputs….strip your charts, stay current, stay organized, follow your best judgement and ALWAYS maintain focus on the most obvious thing to do. Nice article :). After 18 months I am back (= so far) that SR lines are all I need. Good trading to all & find your own style / method / understanding. I’ve been trading the NBT method longer then you have been trading. I wanted to make a point that the NBT style is a method on itself. See FF for the strategy, it containts R:R, stops, methods for entering etc. Steve first states that the NBT method is not a strategy or method, but a foundation from which a trader can develop a system on. On the last paragraph Steve describes the NBT method which has been traded on FF. Those two lines contradicted in my opinion, which then caused me to get confused. Excellent article and the “heart” of all good trading. In my first life as a news photographer, I had to learn one simple fact: A great picture does not consist of all the things you put into the frame, but of all the things you strip out – until the essence of what needs to be said remains. So it has become for my trading now. Get off your cellphones, get off Facebook, only keep what you need to stay focused, and when you stake out your position, let it follow your plan. Thankfully, your site is one of the few I still pay attention to. Thanks. Spring cleaning taken to the charts, a very good idea !! IMHO when you are trying to find your way through the barrage of FX info, it can take time to discern the wheat from the chaff. I have started spring cleaning my PC and trading library. Thanks alot for the awesome post. NBT continues to provide the traders worldwide with unmatch quality posts in the FX market. God bless NBT! Just a line, folks, just a line. I respect this blog and at the same time I am confused. “the obvious thing to do?” Are you F#5*ing kidding me? I don’t see the obvious at all and understand that lack of seeing such an “obvious” thing is due to my intellectual deficits. That aside, would anyone be willing to clue me in? I’m new but obsessed with FX. I mean lifetime obsessed. I don’t expect anyone to hand me some free info, however I would adore some wisdom. I’ve essentially got a plan mapped out to hit 1000+ pips in the EUR/USD correction to 127. I’m married, stable, a Father of three, and a zerohedge lover. I’m also a fan of Abigal Doolittle and a former sheep who just doesn’t have the lack of soul to make a wolf. Certain things matter, certain things don’t, and to a trader basically serve as much as a novelty as anything else. No way I’m saying or would ever suggest that you or anyone else that comes here has any kind of intellectual deficits…just the way the bulk of information (the learning curve) hits this market is usually defunct just based on the fact that a ton of money could be involved and people are just people. Just look at the tons of bad analysis out there…if you’re reading ZH you probably see a lot of it..they always call the bank and insts. out on bad calls. I’m just making a point to drill down and remove the confusion from the routine. A lot of traders get lost in a sea of this stuff – strategies, outputs, etc., in lieu of non-complicated perspectives that are true causes for price moving as anything else. What broker do you use Steve? I see that many charts that you post are different. Also, the color background is peculiar creamish yellow. As usual Steve – a very good summary of what we should be doing! I am getting there, but as in much of life – often easier said than done.